Republican First Selectman candidates Cristina Aguirre-Ross, Robert Mallozzi III and Kevin Moynihan. NEW CANAAN — In the first Republican debate, covering issues like the Outback Teen Center, cell towers, and lingering financial issues, First Selectman challengers Cristina Aguirre-Ross and Kevin Moynihan repeatedly returned to one issue: transparency. Both Aguirre-Ross and Moynihan claimed early and often that incumbent First Selectman Robert Mallozzi III, who is seeking his fourth term, had done a poor job of communicating with the Town Council, of which both challengers are members, and is unwilling to listen to some in town. absence from meetings of the Town Council, of which he is an ex-officio member. “I don’t feel like everybody is welcome in the First Selectman’s office. And unlike what he says, the door is closed to many people who come in to talk to him,” Aguirre-Ross said. Mallozzi said it was the first he’s heard the complaint. “The fact is, they’re a legislative branch of town government. I was a student of politics. I believe in a separation of powers. I do not want to come into a meeting and dominate with my prognostications or my opinions,” Mallozzi said. “My understanding is he wanted that building down. What we went through last summer was the beginning of the break with the Town Council, not being able to trust the First Selectman,” Moynihan said, drawing an audible “wow” from the incumbent Mallozzi. Mallozzi, however, said the need for a teen center had been diminished because of programming offered by churches and other town organizations, and that issues with partying had led some to question the direction of the center, including Chief of Police Leon Krolikowski, who vacated his space on the center’s board. “It’s not an easy decision to make. Nobody wants to say no to a teen center. What politician would want to say no? But seeing the circumstances and seeing who was coming off that board, and the trouble they were having raising money, I was just trying to do the right thing fiscally. It was tough emotionally,” Mallozzi said. The debate included a face-off between Board of Selectmen candidates Nick Williams and Christa Kenin, and Town Council candidates Roy Abramowitz, Tom Butterworth, Michael Mauro, Rich Townsend, and incumbent Penny Young. Incumbent John Engel was not present at the debate. 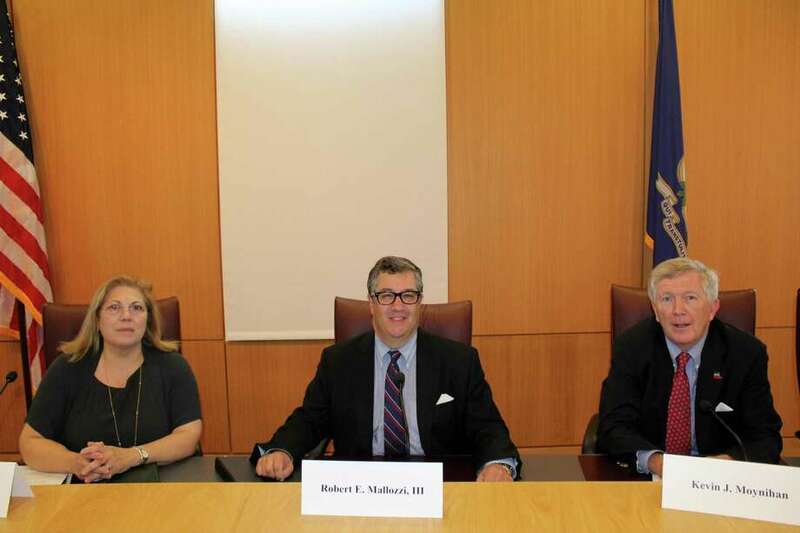 But the most contentious point of the evening was between Aguirre-Ross, Mallozzi and Moynihan. Both Aguirre-Ross and Moynihan expressed a need for change in announcing their intent to run for the town’s highest elected office. And on issues like cell service, parking and maintaining real estate value, they expressed a need for change. “I feel like I’ve been watching this movie for five years,” Moynihan said when asked about the question of improving cell service in town. Mallozzi, on the other hand, touted his accomplishments in his three terms in office, including sidewalks added to downtown, adding parking and minimizing the commuter parking wait list, and changing the culture of the finance department, despite the issues pointed out by the town’s Audit Committee. “I worry about change for change sake. For 10 years I’ve sought ideas from all residents, and they know they don’t need a change in leadership to have their voices heard,” Mallozzi said. A second debate will be held 7 p.m. on July 12 at Town Hall.